Vineyards situation : Côte Chalonnaise is situated South to the Côte de Beaune (after Santenay). There are five main appellations in this area : Aligoté de Bouzeron, Rully, Mercurey,Givry et Montagny. Characteristics : Givry vines are situated around the village of Givry, between Mercurey and Montagny, and around the three hamlets of Poncey, Cortiambles et Russilly. Its chalky brown soil, as a result of the weathering of Jurassic limestone, has given rise to a village appellation often compared to Volnay. Wine making : White Givry is fermented and aged 10-12 months in oak casks before bottling. 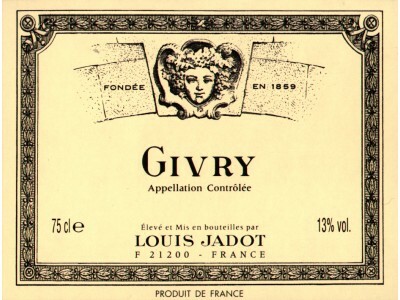 Winemaker's comments : White Givry from Maison Louis Jadot is a slightly golden colour wine. Delicate white flesh fruits aromas and subtle vanilla notes, make a distinguish wine. Gastronomy : It will be best with shellfish, grilled or poached fish and fish in sauce, or white meats cooked with cream as well as mild cheeses (goat). Preservation : As a structured wine, it will easily kept 4-7 years in good conditions of temperature and humidity.